City of Canberra set a record in 1989 for flying non-stop from London to Sydney. Keen-eyed observers at London's Heathrow Airport on the morning of August 16, 1989 would have noticed something unusual about the Boeing 747-438 in Qantas colours that was heading for Runway 28 Right. For one thing the aircraft, which carried the name City of Canberra, registration VH-OJA, was being towed rather than driving there under its own engines. At the short hold position, just before the runway, its tanks were topped up until fuel was dribbling from the vents on the ends of each wing. What would not have been apparent to the casual observer was that this was a special high-density jet fuel, brewed specifically for this flight by Shell Germany. On board the aircraft were yet more signs this was not a normal flight. In the main cabin were just two cabin crew and 16 passengers including senior Qantas managers, media and engineers from Rolls Royce and Boeing. Although the aircraft interior was what you'd expect, there was no galley equipment, and only the forward doors were fitted with life rafts. Another tell that this was not a standard flight was the pilots on board. 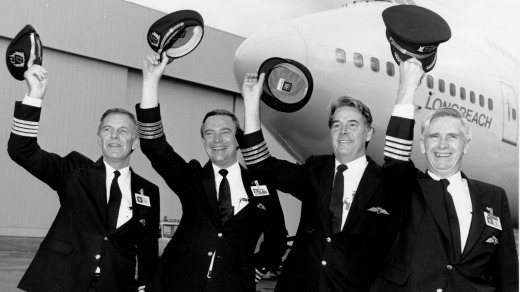 Under the command of Captain David Massy-Greene, all four of the flight crew were Qantas Management Pilots. Three of the four were Senior Check Captains, which is like having Chris Froome, Serena Williams and Cristiano Ronaldo all in the room at the same time. The reason for this anything-but-standard flight was revealed in a comment on the flight plan, with the words "RECORD BREAKING ATTEMPT". The flight plan also contained the crucial information that no stops were planned. The plan was to fly the aircraft non-stop from London to Sydney, the first commercial aircraft ever to attempt a journey of this length, more than 17,000 kilometres. At the time, the record for the world's longest non-stop commercial flight stood at 16,430 kilometres, covered in 17 hours, 22 minutes by a Boeing 747SP. The SP was the stubby, chubby, mini-version of the 747 developed for airlines that wanted a longer-legged aircraft that could operate from shorter runways with a decent payload. 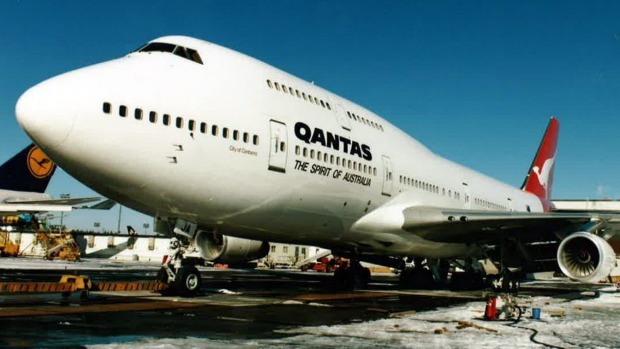 The 747-438 that Qantas was using for this record attempt was one of Boeing's 747-400 series, developed in response to airline demands for a longer-range aircraft but even so, the London-Sydney flight was going to be a stretch. Equipped with Rolls Royce Derby's RB211-524G engines, the aircraft's range was around 14,800kms, well short of the 17,000kms distance between London and Sydney. Only by reducing the weight of the aircraft, topping it up to overflow with a specially doctored fuel and flying an optimal route to take advantage of favourable winds would Qantas avoid the ignominious possibility of having their aircraft forced to land somewhere well short of Sydney. When the fuel tankers uncoupled from VH-OJA as it stood just short of the runway at Heathrow on August 16, 1989, the aircraft was carrying 183.5 tonnes of fuel, which more than doubled its total weight. Just after 8.30am local time, with checklists completed and the engines warmed up, Captain Ray Heiniger in the co-pilot's seat called the control tower to request clearance for takeoff. The air traffic controller responded in the affirmative and signed off with the words "Good luck and don't forget to write!" The flight was textbook. Atmospheric conditions were better than expected, allowing City of Canberra to use less fuel than anticipated. But then somewhere over the Indian Ocean came the news that the weather in Sydney, set fair when the flight departed, had turned foul. The city was shrouded with thunderstorms and low cloud. The wind was gusting to 40 knots and visibility was down to 3kms. Flight control in Sydney was advising a 30-minute holding requirement, and for that, City of Canberra was out of fuel. There were options. The weather over Melbourne and Adelaide was fine. The crunch point was Cowra. Once the aircraft was east of Cowra, there wasn't enough fuel remaining to divert to either Adelaide or Melbourne. It was Sydney or bust. Over Pymble the autopilot was disabled and the pilots took control for the final approach into Sydney. Just before touchdown, a warning chime and an indicator screen flashed the message "FUEL QTY LOW", indicating that less than 900 kilograms remained in the tanks. But it was enough. At 2.20pm Sydney time, VH-OJA, returned to earth, 20 hours and nine minutes after its wheels left Heathrow. Although this was a one-off flight, and a commercial airliner that can travel from Sydney to London with a full load of paying passengers has yet to take to the skies, this was a bold venture that probed the limits of long-distance flights, and a great leap forward in the evolution of the Kangaroo Route. With Qantas's first flight between Perth and London on March 24, the ultimate dream of non-stop flight between east coast Australia and the UK just got one step closer. The Boeing 747-438 that made the historic London-Sydney non-stop flight, VH-OJA, City of Canberra, can be seen at the Historical Aircraft Restoration Society located at Wollongong Airport at Albion Park, just over an hour's drive south of Sydney. This article was written with information from a number of sources, most prominently that written by John McHarg on the aussieairliners.org website.